In order to save her mother, a teen is forced to become an indentured assassin in this sizzling “movie ready” (Kirkus Reviews) dystopian thriller. The good news is that the USA is finally out of debt. The bad news is that it was bought out by Valor National Bank, and debtors are the new big game, thanks to a tricky little clause hidden deep in the fine print of a credit card application. Now, after a swift and silent takeover that leaves 9-1-1 calls going through to Valor voicemail, they’re unleashing a wave of anarchy across the country. Patsy is forced to take on a five-day mission to complete a hit list of ten names. Each name on Patsy’s list has only three choices: pay the debt on the spot, agree to work as a bounty hunter, or die. And Patsy has to kill them personally, or else her mom takes a bullet of her own. Since yarn bombing is the only anarchy in Patsy’s past, she’s horrified and overwhelmed, especially as she realizes that most of the ten people on her list aren’t strangers. Things get even more complicated when a moment of mercy lands her with a sidekick: a hot rich kid named Wyatt whose brother is the last name on Patsy’s list. The two share an intense chemistry even as every tick of the clock draws them closer to an impossible choice. 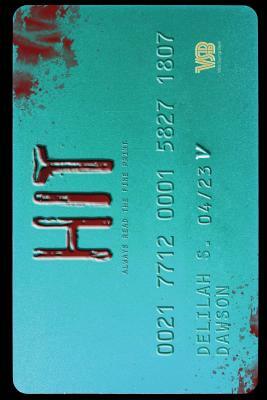 An absorbing, frightening glimpse at a reality that is eerily just steps away from ours—Hit is a taut, suspenseful thriller that absolutely mesmerizes from start to finish. “The quick pace still leaves room for possible romance when Wyatt, the son of Patsy's first hit, unwittingly becomes her backup—and a potential target later on down the list. Their sexual tension and banter add fuel to the suspense, especially when Patsy starts to make connections about her hit list and uncovers clues about the new 'government.' Practically movie ready, this novel will satisfy fans of thrillers and dystopias alike."